“In this text, the path of the lesser individual is presented fundamentally as the abandonment of all wrongdoing motivated by the fear of suffering lower rebirths. Though there are many practices on this lesser path, this description is what the text emphasizes. “Correspondingly, the intermediate path is presented as a path of someone who seeks liberation from all of samsara because they recognize that all of the three levels of existence or realms, in short all of samsara, are states of suffering. By contrast, someone on the greater path seeks the achievement of omniscience—a state of buddhahood that is beyond both samsara and nirvana—through a path that integrates emptiness and compassion. Thus the afternoon session began with the presentation of relative bodhichitta, which occupies stanzas 10 and 11. From beginningless time my mothers have loved me. If they suffer, how can I worry about my own happiness? To give rise to bodhichitta is the practice of a bodhisattva. “What is described here is how we cultivate relative bodhichitta in actual meditation practice—the stages which culminate in the ability to exchange oneself for others. This begins with reminding ourselves of the many reasons for finding beings pleasing, such as they all have been our loving mother, and so forth. And one cultivates this attitude of finding beings worthy of affection until it culminates in great impartial love. Then, on that basis we cultivate the desire to free them from all suffering, which is compassion, and this culminates in the readiness or ability to actually exchange our own happiness or well being for the suffering of others. “The 11th stanza, the second stanza concerned with the cultivation of relative bodhichitta, describes how to implement relative bodhichitta once we have gained the willingness and ability to actually exchange our happiness for another’s suffering. All suffering without exception arises from the desire for our own happiness. Perfect Buddhahood comes from the wish to benefit others. To completely exchange our own happiness for others’ suffering. His Holiness said that we could look at this stanza as presenting the application of our practice in post-meditation, in particular it shows us how to respond appropriately to adversity by transforming it into the means of the path. The idea here is that in post-meditation, when we conclude a session of formal practice, rather than leave the practice behind in the shrine room, we can carry it with us training ourselves to see that the suffering of others is at least as important as our own. The Karmapa commented, “At this point you would be willing to sacrifice your own happiness in order to alleviate the suffering of others. “These two stanzas describe different stages in the cultivation of bodhichitta, primarily through even-placement. “Following that, stanzas 12, 13, 14, and 15, describe how in post-meditation we learn to transform four types of adversity, or the four undesirable circumstances, into aids on the path. To them is the practice of a bodhisattva. To take on their misdeeds is the practice of a bodhisattva. “This describes how to relate to the situation of suffering physical pain through the aggression of another. In return, is the practice of a bodhisattva. “This describes the appropriate response to the third undesirable circumstance, which is calumny or slander. 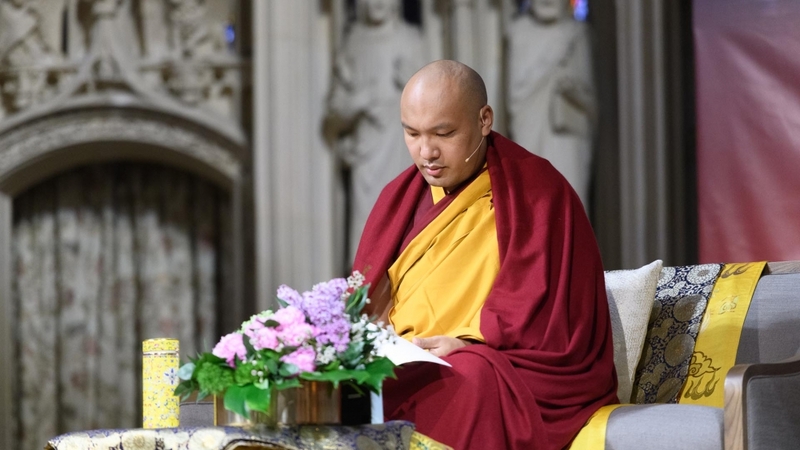 The Karmapa noted that usually we are extremely attached to praise and averse to disrespect, attached to profit and averse to loss, attached to pleasure and averse to pain, and we have a great desire for all the things we are attached to. This verse teaches that we should be free of craving for these things. To love her even more, is the practice of a bodhisattva. Without losing heart is the practice of bodhisattvas. I would see the wealth of samsara as having no essence. To not have pride is the practice of a bodhisattva. I may subdue external enemies, but they will increase all the more. To tame one’s own mindstream is the practice of a bodhisattva. However much you partake, that much your craving will increase. To immediately abandon them is the practice of a bodhisattva. Then His Holiness briefly discussed interdependence, one of his favorite topics and the subject of his recent book, Interconnected: Embracing Life in Our Global Society. He said, “Living in this world of the 21st century, which we’ve come to call the information era, we are able to see more than ever before how each and every one of us is interconnected with each other. The intimate and deep connection between every person and place has become more evident than it ever was, due to our technology, social media, and so forth. This enables us to see clearly how much of an effect we have on one another, and how we all rely on each other…. Each person is not really independent because our happiness and suffering depend on the happiness and suffering of others. “When we fail to understand this, we increase our own suffering and that of others as well as our own selfishness and the problems we make for others. We do need a sense of self-preservation, but a problem comes when that sense of self-preservation becomes exclusive and excessive: it turns into a limitation because we are solely concerned about ourselves and utterly ignorant of the plight and feelings of others. When we allow ourselves to become that way, we are ignoring the fact that our very existence, let alone our happiness, depends entirely upon others. So it is extremely important to understand this interconnectedness,” he added emphatically. 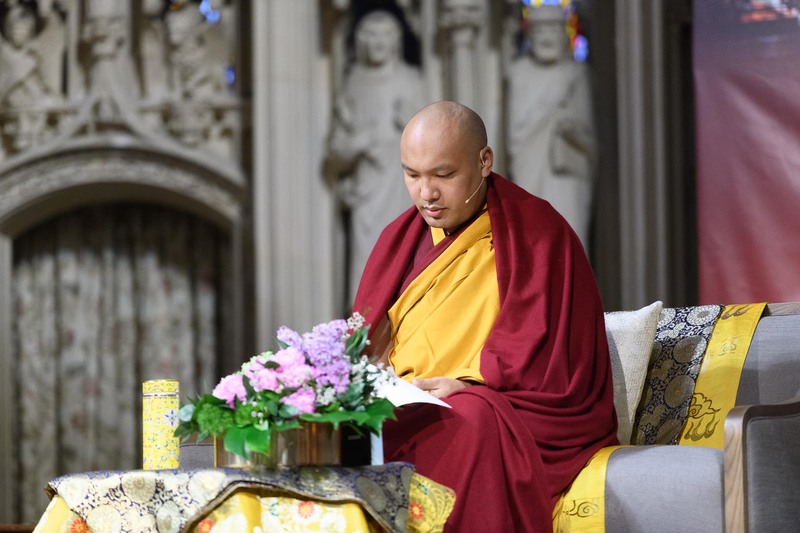 Following up the morning’s teaching, the Karmapa used his own life as a poignant example to illustrate that applying bodhichitta to every situation is the only choice we really have. He said, “If I use myself as an example, because I bear the name Karmapa, a lot of people regard me as a buddha in human form. And maybe that is how they perceive me, but in terms of how I perceive myself, I think I am just like everyone else. 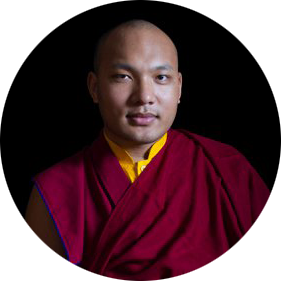 In fact I have problems that some other people don’t have, and I have faced a lot of challenges, and experienced a lot of ups and downs already, but basically I just keep on going, which for me means that I keep on pretending to be the Karmapa. “What keeps me going? I suppose it is a kind of courage. People ask me, ‘How do you handle these situations?’ Some people believe that I handle them because I have divine powers or at least I must have some extraordinary inner practice. But I don’t feel that. Extraordinary practice comes from doing a lot of practice. Actually, how I handle all of this is very simple: I have no choice. I am out of options. I have no choice whatsoever but to continue. And I have experienced that in some ways, choicelessness, having no other options at all, can be helpful. Because in the midst of all of our experiences—giving rise to attachment and aversion and dealing with what we like and don’t like and what we want to hear and don’t want to hear and so on—we often look for an excuse in these situations that allows us to respond to them with our kleshas. The session concluded with the dedication and aspiration prayers and a church full of satisfied students. The third teaching on the 37 Practices of a Bodhisattva can be found here.